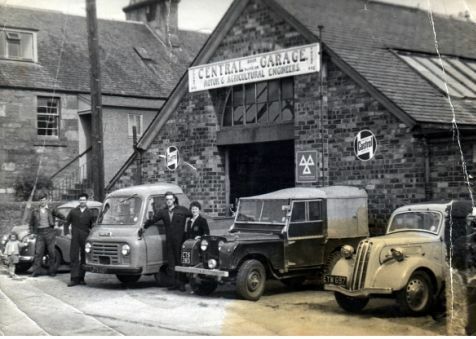 Central Garage opened in St Andrew Street, Alyth in August 1960. The firm was established by 2 local laddies; Graham Buick, a son of Alyth and Jim MacFarlane a son of Glenisla. 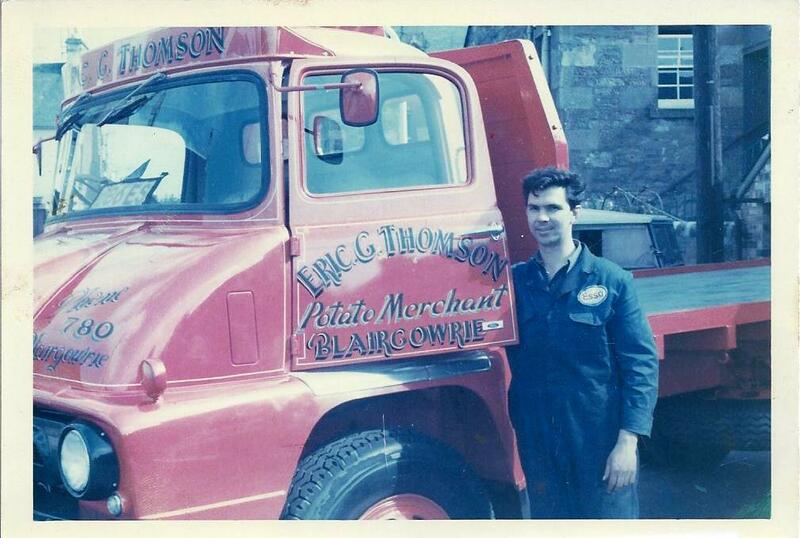 They both had previously worked as mechanics at McBain's in Airlie Street in Alyth. They enjoyed working together and decided to take the brave leap to start up on their own only 2 streets away. Both newly married, Graham and Jim found premises, a bake house, which was being sold by Mssrs Jas Findlay who also had Baker’s shops throughout Alyth including one in Toutie Street and one at the High Street Cross. Before opening, there was much work to be done; pulling out the ovens and arranging the premises for the garage to their own design. Although this did not take them too long they needed to be working and making a living too, so with a kind offer from A Muir and Sons (Coal Merchants), Graham and Jim got the use of the old Jam Factory (now land with housing at the end of Mart Street) and started work for their first customers. 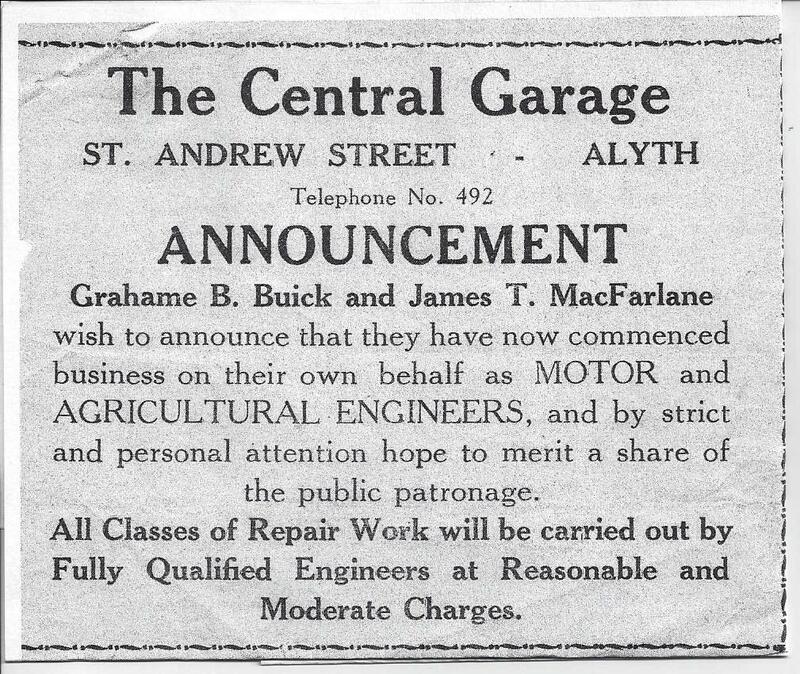 With the bake house transformed, Buick & MacFarlane trading as Central Garage Alyth opened their doors on the 1st August 1960. 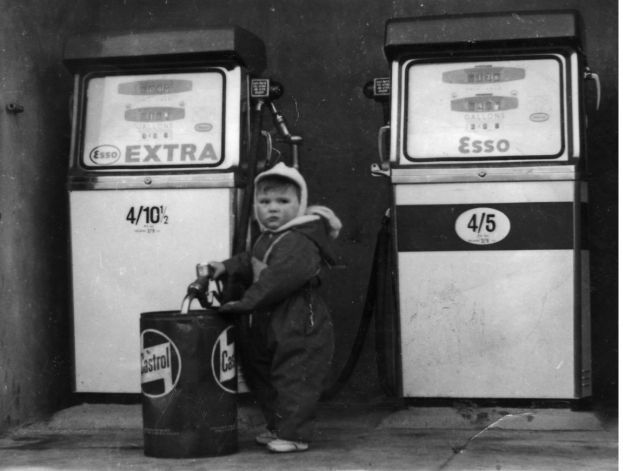 They traded in similar lines as today including car servicing, repairs, petrol sales and in 1964 MOT Testing but they also sold new and used cars, were called out to repair tractors, combine harvesters, and even Walker‘s the Bakers Pie Machine! Although the work was long and hard, many stories can still be recalled of worthwhile trips to Glenisla especially when then the customer was Donald Ferrier at the Glenisla Hotel. They were well compensated! In the early days the pair worked from 8 in the morning until 9 at night, and every Saturday until lunchtime, they also advertised as being on call 24hours, 7 days a week. When it came to employing staff they kept things close to home and the wives Isobel and Janey looked after the invoicing and book keeping but with growing young families and Janey’s career as a school teacher a full time clerkess was required. Helen Gall was employed in 1966 and gave 25 years of service ensuring every nut and bolt was accounted for, staying with the garage until her retirement in 1991. She was still assisted by Isobel through these years with payroll duties, as the employee list grew. They employed many other sons’ of Alyth including Sandy Smith, Charlie Orchiston, Willie Symington, Graeme Douglas, Ally Gowans, Donald Buick, Ron Gilmore, Davie Jump, Lindsey Kydd, Charlie Palmer, Davie Irvine, Sandy Tosh and Mark Murray. In 1990 Jim sadly took early retirement after 30 years in the partnership and Graham was then joined as a partner by his son David who had already worked for the business for around 10 years. Sadly, not long after this, however, Graham took a back seat with the business after suffering a stroke in 1991. Although not at the garage every day, Graham was on hand to step in when needed and indeed enjoyed going down to the garage to meet old customers and continued MOT testing motorcycles right up until 2004. With all the changes around 1990 the Buick family was looking for stability having had these 3 key people retire and when Graham’s daughter Kay returned from studying in Edinburgh they persuaded her, with the promise of computerisation, to take a short placement at the garage. Ten years later, she managed to secured time off for maternity leave, and is now Company Secretary and also works part time looking after many of the tasks once undertaken by her mother Isobel. 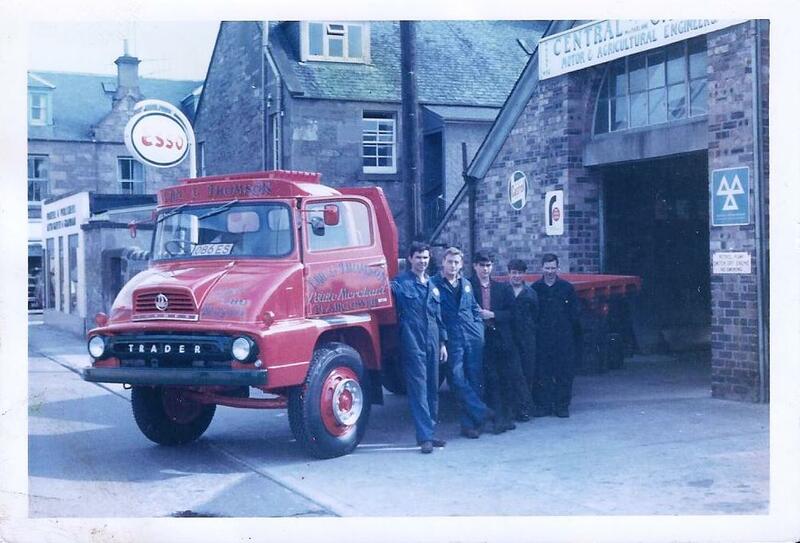 During these years the garage also employed Alan Stewart, Glenshee Andy Pate, Glenisla and Ian Dorward from Alyth. Not many businesses survive into the third generation, so the statistics say, but after a change of career in 2007, grandson to Graham and son of David, Scott embarked on his apprenticeship at the ripe old age of 26! Scott has now qualified from Dundee College and looks forward to the new challenges ahead but probably none of the old fashioned tips, which came the way of his grandfather and Jim! Even running a busy garage all Buick men, Graham, David and Scott, all have managed to be retained firemen serving the people of Alyth, with David having only recently retired after 25 years service and Scott signing up not long after that. Not all of the faces at the Central are new and the team today is proud to have clocked up almost100 years between them: working alongside David 32years, Graeme Douglas, one of the original employees of Graham and Jim in 1973 has now served at the Central for 39 years, Kay 22years. Donna McNicoll, clerkess for 10 years, Scott 6 years . When starting out all those years ago, Alyth was a bustling community with lots of trades doing business, serving every need of the people of Alyth and district. There are not so many now but there is still a buzz about the town and the sense of community is still, we believe, strong. Sadly Graham Buick passed away in 2008 but along with Jim, Graham’s family would like to thank all of their customers from the past and present for their trade and support over these past 50 years. David looks forward to keeping the doors to" the Central" open for many years to come and with the third generation, his son Scott.